I’m very happy to introduce this kongbiji-jjigae recipe to you today. 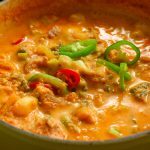 The first thing that comes to mind when I think of this ground soybean stew is the sight and sound of it sizzling and bubbling in an earthenware pot in the cold winter, just like I used to have it growing up. Warm, creamy, nutty, and healthy, it’s the perfect stew for colder weather. Kongbiji is soy pulp, which is leftover from the process of making tofu. In that process the soaked soybeans are pureed and then filtered through a sack. What’s filtered is used for tofu and the the soy pulp left in the sack is kongbiji. In this recipe, we won’t make soy pulp that way, we’ll puree soybeans in a blender. If anyone ever asked me which of my grandmother’s dishes was her most delicious, I will definitely say, “kongbiji-jjigae!”. I was fascinated with her kongbiji-jjigae ever since I first saw and tasted it. I used to follow her when she went shopping and she would buy a lump of kongbiji at a local tofu factory. When she brought it home and made this stew for breakfast on a freezing cold day in the winter, it was always in the center of the table, sizzling and bubbling and making us all feel warm even before we tasted it! Whenever she was ready to serve a meal, she said, “Open the table!” She had several different sizes of tables, stored between the rice chest and the wall. My uncles took out a large circular wooden table. The table legs were folded, so several tables could be placed in the gap. One of my uncles unfolded the legs of the table, another cleaned the table with a wet cloth. My uncles set spoons, chopsticks, and side dishes on the table. Then my grandmother scooped rice from her huge cast iron pot into small individual bowls and my uncles and I helped her put the bowls on the table. Then the last dish to the table was this kind of sizzling stew! She always brought it at the last minute, so all family members could enjoy it hot, as long as possible. The important tip in this recipe is not to vigorously mix the ground beans in to the stew. Do it gently, like I do it in the video, because if the beans get too mixed in, they will sink to the bottom of the pot. Slip your spoon into the bottom of the pot and then bring it up gradually, and shake the beans softly from underneath. That will keep them creamy. I hope you enjoy this recipe with your friends and family. Serve it bubbling and make everyone warm! Put the anchovies and dried kelp in a sauce pan. Rinse the beans and drain. They will expand to a little more than 1 cup. Blend the beans with 1 cup water until creamy. You will get about 2 cups ground beans. Heat a heavy, 2 quart pot (or Korean earthenware or stone pot) over medium high heat. Add the sesame oil, garlic and onion and stir for 30 seconds with a wooden spoon. Add the pork, soy sauce, and ground black pepper and stir for 2 to 3 minutes until the pork is no longer pink. Add the kimchi and stir for 5 minutes until the kimchi turns a little soft. Add 1½ cup anchovy kelp stock (or chicken or vegetable stock). Cover and cook for 5 minutes. Pour the ground beans over the stew. Gently stir and turn the stew over with a wooden spoon. Cook for another 5 to 6 minutes with the lid open until the beans are fully cooked and bubbling. Taste it to test if the beans are fully cooked. It should taste nutty. Add the salted fermented shrimp (or fish sauce or 1-2 teaspoons salt to your taste) and stir. You can add the leftover stock if the stew is too thick and you want to thin it out a bit. Add most of the green onion, green and red chili pepper, leaving some back for a garnish. Stir a few times and cook for 1 minute. Add the rest of the green onion, green and red chili pepper as a garnish. Remove from the heat and serve right away with rice and more side dishes. Posted on Saturday, February 20th, 2010 at 12:59 pm. Last updated on November 29, 2018. Posted March 31st, 2019 at 9:43 am | Log in to reply. My 7th grade daughter and her friends have been interested in Korean culture this year and volunteered to run the Korean booth at her school’s International Fair since the family who normally ran the Korea booth couldn’t do it this year. Every booth representing a country features food. None of the girls are ethnic Korean but I cook as a hobby so I wanted to find a recipe that was approachable to 7th graders cooking (with supervision) but could be cooked the day before and brought to the school. 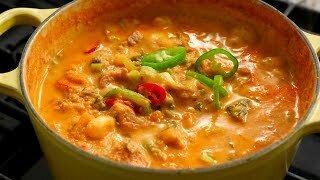 I had never cooked a Korean dish before, but a Korean-American friend recommended this website and I saw this stew. Upon watching the video and listening about how your grandmother served this to you, I knew I had a possibility since I wanted a comfort food recipe that you would find in someone’s home. I went shopping for ingredients at the local international market store and had the girls cook a meal two weeks before the event so that they could get the hang of cooking before serving it to others. Once they tasted it, they went back for seconds and thirds! So we had the girls cook it again the night before the fair, expanding the recipe by a factor of 10 (about 14 quarts of stew). And sure enough, it was a big hit at the International Fair, even with the ethnic Koreans who tasted it. We paired it with a kimchi rice that we modified for a rice cooker instead of a cooktop and that went well too. And it was all gone at the end of the fair. Thank you for a wonderful dish! The girls learned so much! We will make this again for ourselves. Posted February 13th, 2019 at 12:36 pm | Log in to reply. Delicious. Thank you for sharing this wonderful recipe. Posted December 27th, 2018 at 12:28 pm | Log in to reply. Maangchi, what size is your yellow Le Creuset pot? Posted December 2nd, 2018 at 8:48 pm | Log in to reply. I just had to try this recipe when I saw it. It is quickly becoming one of my favorite winter comfort foods! Thank for sharing your recipe. Posted December 1st, 2018 at 7:15 pm | Log in to reply. I saw this video and it looked amazing and I really wanted to make it! Unfortunately I had no kimchi, or soy beans, or meat in the fridge! But I was also too lazy to go out and buy it as it is quite far to go to get kimchifrom where I live. I remembered you had emergency kimchi recipe and luckily I had cabbages left in the fridge so I made your delicious emergency kimchi for the soup! Hahaha. Then I replaced. The soy beans with a tin of cannellini beans..I figured they are both white so why not..and just as luck would have it, I remembered I had pork sausages in the freezer from the week before! So I was able to make your delicious soup! It’s a bit different but it was super yummy and my husband ate so much rice with the soup slurping it all up to the very last drop. Thank you for another great cosy recipe! This recipe was originally posted on February 20, 2010 at 12:59 pm by Maangchi. It was last updated on November 29, 2018. The video was watched 277,008 times on YouTube & has 9,621 likes! This video is a remade version of an earlier recipe. The original video was posted on 2010-02-20 and has 144,048 views.